You can continue the legacy of protecting the Connecticut River and our region’s waters for future generations. Restoring and protecting our rivers is an enduring effort. CRC was started in 1952 by committed individuals like you who believed that present and future generations deserved a clean river. 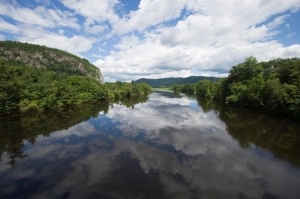 Their hard work and the generosity of CRC members helped to transform the Connecticut River from “the world’s most beautifully landscaped cesspool” into a nationally-recognized treasure. Yet the river continues to face threats – and will for years to come. Making a legacy gift to CRC is a generous gift you can give to future generations. When you make a legacy gift to protect the river, you join CRC members and friends in the Long River Society who care about protecting the river for years to come. Legacy gifts may take the form of a bequest, charitable gift annuity, designating CRC as a beneficiary of your life insurance or retirement accounts, or other planned gift. Please note: CRC maintains its legal name, Connecticut River Watershed Council, and all planned gifts must reference that legal name. Therefore, existing bequests or other planned gifts which list Connecticut River Watershed Council are correct, and need not be revised. We are honored by the dedication of members who are helping to protect the river for generations to come. Contact Corey Kurtz, Development Director, to learn more about your giving opportunities or to join the Long River Society. You may reach her at 413-772-2020, ext. 202. CRC’s long-standing role as the river’s guardian gives me great peace of mind that its interests, and those of the wildlife and people that use or depend on the river, will be protected.